This stainless steel riser bracket raises the AED off the cabinet floor so it displays very nicely in the cabinet window. Allows for storage underneath the bracket. Works with all cabinet brands. 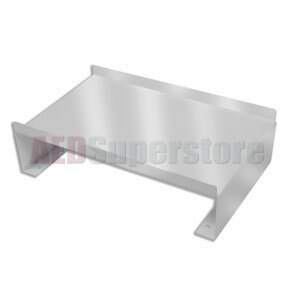 Stainless Steel Riser Bracket works best for Stainless Steel 'Surface Mount' AED Wall Cabinets. Please note: Many recessed and semi-recessed wall cabinets have a painted white finish interior tank (see AMP1900).